BHS offers a variety of industrial storage solutions including mobile storage lockers, work stations, and stationary shelving units. 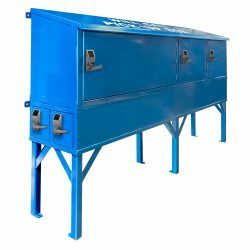 These units are manufactured from heavy-duty steel for long-lasting durability. Custom-built models can be made to the customer’s specifications. Customizable, industrial-grade steel shelving for reliable storage. Safe and convenient access for specialized materials. Portable and secure storehouse for protecting valuables. Keep tools and valuables secure, indoors and out. Guard assets from theft beneath a functional computer desk. Impenetrable steel storage for sensitive materials. Secure storage with one-time pass codes for off-hours delivery. Every operation needs a secure way to store valuable equipment, tools, and information. High Value Carts can help your operation keep track of valuable assets without reducing productivity. Each of these options comes equipped with casters and a push bar, making it easy to move tools and assets to wherever they’re needed. The decision between an HVC and the HVC-WS comes down to your particular application. If you need a portable computer station, the HVC-WS is the better choice. To protect tools and valuables on-site or at a facility, choose the HVC. 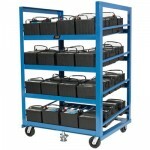 The High Value Cart is a heavy-duty steel cart with a powder-coat finish. The High Value Cart is available in three sizes. Rigid shelves are adjustable and doors open 180 degrees so you can lock-up anything from a calculator to bulky power tools. Move your high-value materials to where they’re needed and keep them secure with a strike-protected padlock. The High Value Cart – Work Station protects electronics and also serves as a mobile computer desk. If your operations require the movement of valuable digital assets, like laptops, external hard drives, CDs, or other high-tech equipment, you’ll appreciate the High Value Cart – Work Station, which comes equipped with a locking cabinet and a six outlet power strip. Non-slip shelves mean that valuables won’t slide around while in transit. BHS offers customizable Industrial Shelving with heavy-duty, powder-coated surfaces that keep your materials accessible and organized without damaging your assets. These can be customized to fit any space. Automotive Battery Racks are specially designed to resist acidic corrosion and scratches, making them ideal storage solutions for everything from lawn mower batteries to commercial batteries. 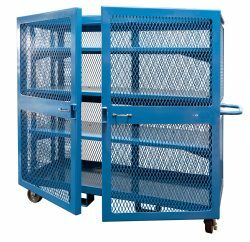 These racks are specially designed to stand up to harsh industrial environments. In addition to these existing designs, BHS can manufacture specialized racks and shelving to meet your operation’s specific needs. 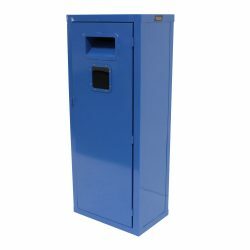 Industrial Storage solutions for your business can help keep valuable equipment safe, secure, and accessible to authorized personnel. Download a detailed PDF from these product pages or contact our sales department at 1.800.BHS.9500 to determine which Industrial Storage options are the best fit for your operation.